Details of a £174m project to fill in the missing link in the motorway network between England and Scotland are to be explained. The plans are to build the 'Cumberland Gap', which would involve widening the existing A74 into a three-lane motorway in both directions. The road was completely closed for 24 hours in December after a fatal three-lorry crash. A public exhibition is being held in Rockcliffe on Monday. The nine-kilometre stretch of the A74 is the main route between England and Scotland and carries 42,000 vehicles a day, including around 10,000 heavy goods vehicles. As well as widening the existing road, the plans include creating a separate road for local traffic to run alongside. Other work will involve building a new bridge over the River Esk to carry non-motorway traffic and replacing the Mossband Viaduct, which carries the A74 over the West Coast Mainline. People will be able to see the proposals at a public exhibition at Rockcliffe Community Hall, Rockcliffe, on Monday between 1400 and 2000 GMT and on Tuesday at the same times. 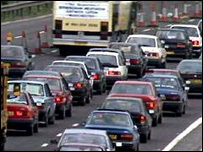 Staff from the Highways Agency and project team will be there to answer questions.